For 119 years the Dutch shipyard Royal Huisman has been making luxury and large yachts. 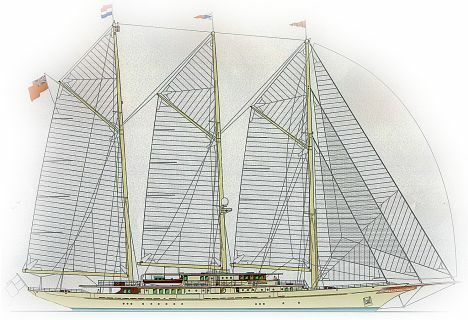 One of the shipyard's creations currently under construction is Athena, an 89 metre three-masted schooner. Designed according to modern criteria and guaranteeing high performance it looks like a schooner from another era, with everything smelling of the sea and "alive" in spite of modern materials used by the shipyard to limit and handle weight. This is an example of how modern technology can dwell in the lines and forms of the past, which have that romantic appeal that only vessels of bygone days can evoke. There are three decks; on the main one the deck surface is completely lined in teak and there are two outdoor living areas astern with two others forward of these with sofas, table with chairs and lots of space. Approaching the bow is the lounge which on the forward bulkhead gives onto the dining area; still nearer the bow there is the galley, office and a recharging point for the diving cylinders starboard and a hold on port side. On the lower deck there is a spacious owner's suite astern, with four other guest suites towards the bow. In the mainmast area there are spacious engine and machine rooms while the stern area is for the crew, who have been reserved eight cabins, independent galley, lounge and mess hall. This area also houses the laundry room. The upper deck houses a lounge, captain's cabin with double bed and the bridge. There are no fewer than four tenders, two of which are custom made, specially for this splendid yacht. 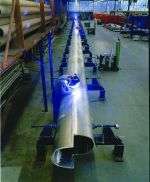 For further information please contact Royal Huisman Shipyard B.V.; Flevoweg 1; P.O. Box 23; 8325 ZG; Vollenhove; Holland; tel. 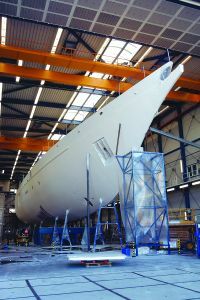 +31 (0) 527 243131; fax +31 - (0) 527 243800; web-site www.royalhuisman.com; e mail: yachts@royalhuisman.com. Naval architects: Pieter Beeldsnijder Design and Gerard Dijkstra & Partners.